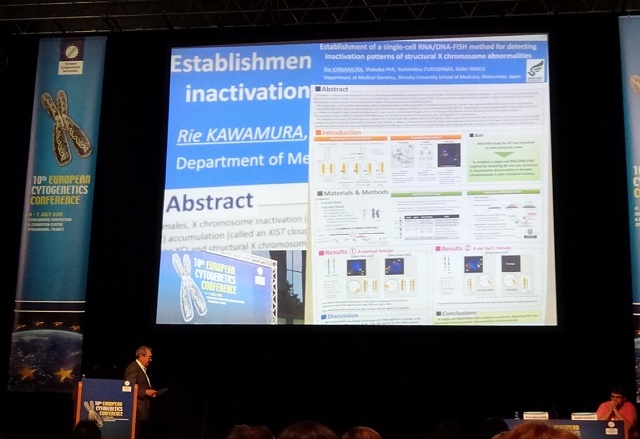 Assistant Professor Rie Kawamura, Senior Assistant Professor Keiko Wakui and their colleagues from Shinshu University School of Medicine Department of Medical Genetics won a poster prize at the 10th European Cytogenetics Conference, which was held from July 4 (Sat) to 7 (Tue) in Strasbourg, France. This honor was awarded to only 5 of the 213 poster presentations that were delivered during the conference. Females have two X chromosomes, one of which is inactivated. Symptoms associated with X-linked disorders in female carriers have a broad range due to X inactivation pattern. They had designed a three-color RNA/DNA-FISH method for checking each individual cell to see whether the normal X or abnormal X had been inactivated in a subject with structural abnormalities in X chromosome that are detectable by FISH analysis. Then, they carried out this method to a female carrier and demonstrated how their single-cell analysis has benefits over conventional methods of analyzing X chromosome inactivation. This research forms part of the cytogenetic research being carried out by Dr. Wakui and her colleagues as one of this laboratory’s research projects. This research is expected to be applied clinically in the Shinshu University Hospital Division of Molecular and Clinical Genetics, of which Professor Yoshimitsu Fukushima serves concurrently as director.